Flatcable-assembly.com supplies customised prefabricated flat cables for large and small rooms. As an installer, your compile a flat cable yourself at Flatcable-assembly.com, in every required length, with the supply and/or tap-off modules that you require. Our flat cable machine customises your flat cable and tests all supply and tap-off points. Within 2 weeks, you will receive a prefabricated flat cable that you can install simply and easily. Simple: plug and play. flat cable for power + data (for e.g. DALI or KNX installations). You can easily adapt prefabricated flat cable in the building yourself if an extra tap-off is still necessary. That keeps the installation flexible. You can make the flat cable suitable for different applications (e.g. for lighting and cooling) by adding components to the cable. On the basis of the installation design, you determine which components (blocks) you need at which position on the flat cable. You can have several different components fitted per metre of flat cable. The supply and tap-off modules (components) fitted do not lead to any voltage loss. You can lay and adjust prefabricated flat cables simply and easily. 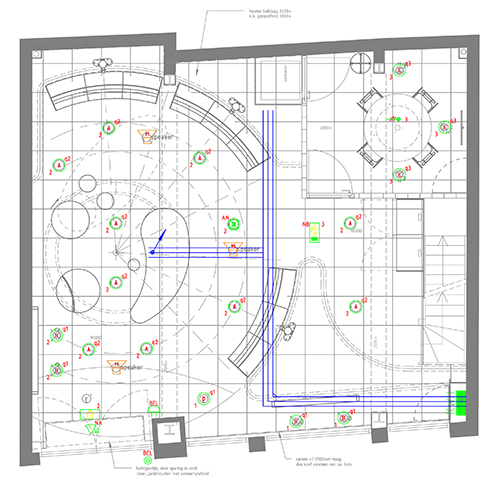 By moving or adding components, you keep the technical installation flexible. If, for example, an appliance is moved, you move the accompanying connection on the flat cable. In this way, you can respond easily to changing requirements for the layout of a shop or office. Fast and flexible installation with prefabricated flat cable. Because there are no limits for the length of flat cable, it is often used in large renovation and construction projects, such as retail premises or offices. With prefabricated flat cables, you can install many metres quickly and simply. As a result, a room is ready for use faster. Flat cable is also highly suitable for small surface areas with different functions. With just one flat cable (with integrated KNX or DALI transmission signals) and a smart socket, you can install a complete electronic installation in a small room, such as a kitchen in a holiday chalet. Thanks to its flat shape, flat cable takes up little processing space. Because you can connect several components to a flat cable, you avoid a forest of wires. If the requirements for the layout of a room change over time, there is no need for a complete new installation if flat cable has been used. Often, all that will be necessary is to move or add components on de flat cable. That saves time and money. With flat cable, you have an almost unlimited choice of lengths and colours. There are also countless possibilities for adding components. Every phase wire on a flat cable can supply a maximum of 3500W. The limits for the flat cables used are largely determined by the electric groups present. Would you like to know more about the application possibilities for flat cable? Feel free to contact us. In 2016, Conntech developed a machine that enables components to be fitted quickly and easily to flat cable. Until then, we fitted the blocks manually. With Flatcable-assembly.com, you can be sure of being able to install a good product in no time. With our configurator it's possible to design flat cables at your desk. To get an impression to how it works you can use the demo-account. All your colleagues have to do is rolling out the flat cable in a cable tray and plug-in the connectors. You will be saving on the installation hours! At Flatcable-assembly.com, you can easily order customised prefabricated flat cables for large and small rooms. You will receive your order within two weeks. Extra short lead times are possible for urgent orders. Have you placed an order with Flatcable-assembly.com before? Are you ordering from Flatcable-assembly.com for the first time? Then first create your account here. Conntech is an prefabrication production company in Elst (Gelderland), the Netherlands. The name �Conntech' is an abbreviation of Connection Technologies. The company's objective is to realise smart and flexible connections of technologies, objects, people and organisations, together with partners. Conntech conceives and designs installation concepts and components which help installers save time and costs and with which they can easily upscale or downscale within a project, or can improve the quality of a technical installation. The designed technical installation parts are produced at the company's own plant. Prefabricated flat cable is one of Conntech's smart installation concepts. Until 2016, Conntech compiled the flat cables manually for one of its customers. Conntech has since developed a unique flat cable machine. This machine is the only one of its kind in Europe. This flat cable machine has halved the processing time for customised flat cables and has improved their quality and the working conditions. Customised prefabricated flat cables can now also be ordered for external customers via Flatcable-assembly.com. In ordering, you can enter precisely what your requirements are. We then produce the customised flat cable for you within two working days. Would you like to know more about Flatcable-assembly.com or Conntech? Feel free to contact us. The data entered could not be processed.